MIKE WEAVER: "I MISS THE 15-ROUND FIGHTS...THEY TOOK SOMETHING FROM BOXING"
"I miss the 15-round fights because that showed you were something special. It was 15 rounds and I think when they changed it to 12 rounds, they took something from boxing. I prefer 15 round fights and I wish they would have never stopped...I admired George Foreman. I used to work with him when he was 22 years old. But my boxing idol was Ali. I used to always watch him fight on TV. I got into boxing basically by accident with the Marine Corp," stated former heavyweight champion Mike Weaver, who talked about his career, the current state of boxing, and much more. Check it out! PC: It's great talking to you man. You sound like you're 21 years old. How have you been? MW: (Laughing) No, I'm an old man. I'm 61 years old. Everything is alright, man. PC: You are still in amazing shape. How do you do it? MW: I just try to keep my body in shape; everything is alright. PC: It's been awhile since you have been in the public eye. What have you been doing? MW: I haven't been doing too much. I was supposed to be going to an event the WBC is having this weekend in Las Vegas, but I'm not able to make it there. I really haven't been doing too much, but I'm trying to get back in the public's eye. I'm trying to do that now. PC: Like I said, you are in tremendous shape. Do you still do boxing training, go to a regular gym and do weights, jog or what? MW: I still do 25 minutes of aerobics every day and I lift weights, and then I go hit the bag; do bag work. I train the same way I did when I was boxing; same thing. PC: You preserved yourself well. in February, I think I was 280, but I bet one guy I will get down to 260. He said, "Nah, you got too much muscle mass." So we bet and I won. So then I said I can get down to 240. "Nah, you ain't getting down to 240." I'm about 250/253 right now. I told him I'm gonna get down to 240, and as a matter of fact, I might get down to 235 if you bet me a million dollars (laughing). I'll cut my leg off for that kind of money. PC: You have been in some helluva fights; of course the comeback knockout of John Tate in the 15th round is your most known fight. Which fight do you feel was your best performance? no, I think [Gerrie] Coetzee was my best fight. I think that was my best fight because a lot of people thought I was throwing myself out and they thought he was going to whoop me. I went to his hometown and beat him in front of his people; 16,000 people cheering for him and that was my greatest fight and moment. PC: Do you still follow boxing? MW: Yeah, I still watch fights; yes. PC: Do you miss the days of the 15-round fights, because as hard as it is to believe, your fight against Tate was your first time being in the 15th round? MW: I miss the 15-round fights because that showed you were something special. It was 15 rounds and I think when they changed it to 12 rounds, they took something from boxing. I prefer 15 round fights and I wish they would have never stopped. PC: A lot of good fighters out there today, of course not too many in the heavyweight division, your old division, but who are you paying attention to these days? I couldn't tell you the last heavyweight fight I actually watched. PC: You haven't missed too much. MW: (Laughing) That's what I was told. PC: You guys had a different mentality. For instance, anyone who watched your fight with John Tate, and I encourage everyone to check it out, but by the way you came out in the 15th, I would have never guessed that was your first time seeing that round. You guys were just different animals. but I trained every day and ran my 5 to 6 miles every day. I did my 500-800 pushups a day and stuff like that. I sparred 10 to 15 rounds a day and that was it. PC: You pretty much prepared for the fight in the gym. MW: Right. I prepared for the fight in the gym. If I was going to fight for 10 rounds, I sparred 10 rounds, and if I was gonna fight 15 rounds, I sparred 15 rounds. And we sparred hard. I had hard sparring partners. It wasn't anybody for me to just beat up on. Most of the time, my sparring partners beat me up (laughing). But that's what it's all about, man, you gotta learn from experience and you had to spar with the best people to get to a certain point. PC: Who was your boxing inspiration and how did you get into the sport? MW: Well, first of all, I hated boxing (laughing), but when I actually started boxing naturally, my favorite fighter was Ali. I admired Ali and we became friends, and even though I was champ at the time, I used to go to his house all of the time and I was like a little kid. And he'd say, "Man, you a champion." It didn't matter though. I used to always go to his house. I admired George Foreman. I used to work with him when he was 22 years old. But my boxing idol was Ali. I used to always watch him fight on TV. I got into boxing basically by accident with the Marine Corp.
PC: Are you able to stay in touch with some of the old school guys through social networking and things now? MW: I spoke to James Tillis. He called me yesterday. I still talk to some of the people. I was talking to Ken Norton, but now he's in the hospital. He's not doing too good. Ali ain't talked to me in a while, but I still talk to guys from back in my days, people that I fought and worked with. PC: And we lost some good ones too, like Ron Lyle, Joe Frazier, and recently Michael Dokes. MW: Yeah! Ron Lyle, I used to work with Ron Lyle too back in the day. I never worked with Joe Frazier, and then like you said, Michael Dokes were big losses. It's been crazy. PC: Is there anyone you never had the opportunity to fight that you wanted to fight? actually, I wanted to fight Larry Holmes again in our primes, but we didn't fight until late on. We fought twice, but the second time we weren't in our primes. I was 49 years old and he was 51, so naturally it wasn't the same. Other than that fight, there really wasn't anybody. I wanted to fight Dokes again after our fight, but Michael Dokes said he would fight his mother before he fought me again. MW: (Laughing) That's what he said, he would fight his mother before he fought me again, so that was that. PC: The thing I liked about you is that you couldn't put your young fighter in there against Mike Weaver because you would ruin them. There are really no other guys around now in the heavyweight division where if you put your young fighter in with them, they will ruin them. You were that guy. MW: I ruined a few of them in my life (laughing). They used to say, "Mike Weaver is not the guy to fight. Don't fight him." 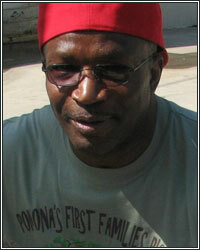 I remember Cus D'Amato told Mike Tyson's people, don't take a chance fighting Mike Weaver. I did mess up a lot of young fighters coming up who thought they were gonna make a name by beating me and I didn't allow anything like that. PC: In my opinion, Larry Holmes is one of the greatest heavyweights of all time. You have fought him twice. Where would you rank him? MW: Of course I actually put Larry Holmes as one of the top 5 greatest heavyweights of all time. I really do think he was that good. I remember after I fought Larry Holmes, I pulled his arm and I said, "Hey man, you are gonna be a great champion." He said, "Yeah, right," or something like that. He didn't want to talk to me (laughing). But I said he was gonna be a great champion and I actually rank him in the top 5. PC: You named two fighters that you enjoy watching, so I have to ask you, do you think we ever see a Floyd Mayweather/Manny Pacquiao fight? MW: I think Pacquiao/Mayweather will be the best fight to never happen (laughing). I hope that thing do happen, man, but I just don't see it. I don't know. It's been talked about for four years and it hasn't happened, so I don't see it happening. PC: Yeah, it didn't take that long to make Marvin Hagler and Ray Leonard, and Ray had retired for 2 years (laughing). PC: It was great catching up to you. You sound and look great, man. You keep in touch with me, okay? MW: Thank you, and call me anytime, man.